The Finnhütte is about 55 square meters and can accommodate up to 5 people. It is equipped with a combined living room and bedroom with upholstered furniture (sofa bed), armchairs, satellite TV, radio and 1 bed, a mini-kitchen with electric hob (2 plates), refrigerator, div. Kitchen appliances and dining area, a bedroom (accessible via steep stairs) with 3 beds and a bathroom with shower and toilet. The house has electric heating and a furnished terrace with lake views. 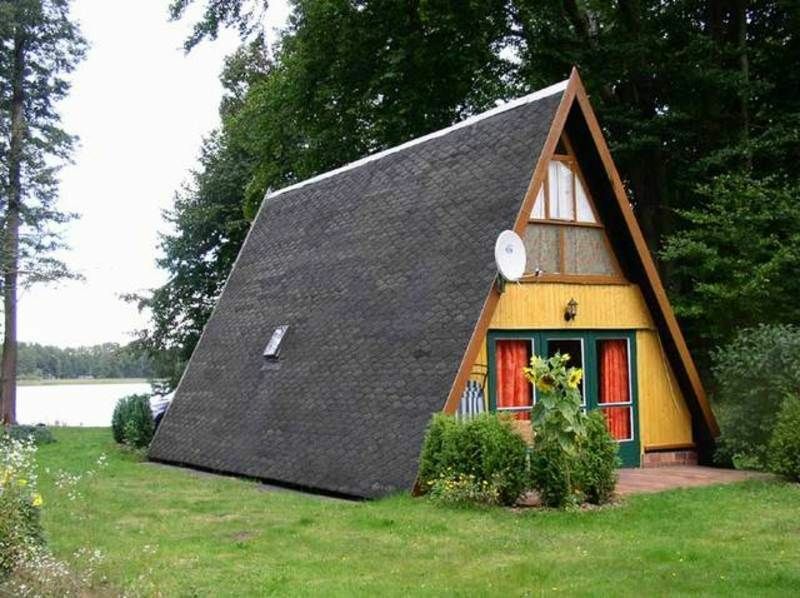 Directly on Schlabornsee, in a quiet edge of the forest is located on a 3. 500 square meter separate lakefront property, the small resort with three cottages. A restaurant is about 1 km away. It is about 2 km to the nearest supermarket and a bakery. The three cottages are in close proximity to each other and are equipped differently. The exact equipment parameters can be found in the description of the respective residential unit. For all accommodation units are available: fishing and bathing jetty, bicycles (free), boat rental (fee, locally), children's playground, barbecue, fireplace and parking. Boat rental: boats brought per lfd. Meter 2,00 Euro rowboat 20,00 Euro / day (6 hours) small motorboat 2,5 HP 45,00 Euro / day, middle motorboat 2,5 HP 55,00 Euro / day (6 hours), kayak 35,00 Euro / day, Canadier 35,00 Euro / day For all objects included in the total price: final cleaning, water consumption. Bed linen and towels are please bring your own. To be paid on site: energy consumption, tourist tax, pet (if applicable). Pets: In this object, the traveling of a small dog up to a Risthöhe of 40 cm is allowed (2 EUR / night plus 10 EUR one-time cleaning fee). In the object there is a linen obligation! All other animals must be approved by the owner before booking. The pet must be registered with the booking. Should a booking notice is not possible, a registration must be done. Zechlinerhütte is an attractive resort in the Rheinsberg Lake District in Brandenburg and a district of the city of Rheinsberg. Zechlinerhütte lies in the midst of a forest and lake-rich environment directly at the Schlabornsee. The surrounding lakes offer ideal conditions for water sports enthusiasts and anglers. For water walkers, the area is particularly attractive because the many waters of the region are all interconnected. Also for cyclists and hikers a trip in the undisturbed and quiet nature of the region is recommended. In the forests, there are good conditions for watching birds and game or gathering mushrooms. In the village there is a small restaurant and a supermarket with bakery. It is about 2 km to the larger supermarket and train station. The nearest motorway junction is about 40 km away. The nearest lake is the Große Zechliner See and is about 2 km away. It is about 12km to Rheinsberg. Rheinsberg is a state-approved resort. By the Prussian crown prince Friedrich, who in the 18. In the 18th century Rococo Castle in Rheinsberg, the town became a thriving cultural center and inspired, among others, Kurt Tucholsky and Theodor Fontane. Today, on the grounds of the castle, which also houses a theater, the chamber opera and the Kurt Tucholsky Museum, the annual chamber opera festival and other musical events take place every year. In addition to the interesting old town with numerous restaurants and cafes include passenger shipping, boat and bicycle rental and a bathing establishment on Grienericksee to the visitor's magnet in the village. Connection to the long distance cycle path Berlin-Kopenhagen is in 20 km.